A doctor from Boston moves his family to rural Maine and takes a job at a university health center so he can spend more time with his kids. When tragedy strikes, he resorts to desperate measures to make things right but winds up making things far worse than he could have imagined. Prolific author Stephen King's book "Pet Sematary" was adapted previously by director Mary Lambert in 1989. That film had a screenplay that was written by the horror legend himself. It was low budget and a little cheesy, but overall, supremely effective. Thirty years have gone by, and as is the case with all moderately successful properties, a remake was inevitable. The story has been updated and slightly modified by writers Matt Greenberg and Jeff Buhler, and the picture is helmed by "Starry Eyes" directors Kevin Kolsch and Dennis Widmyer. 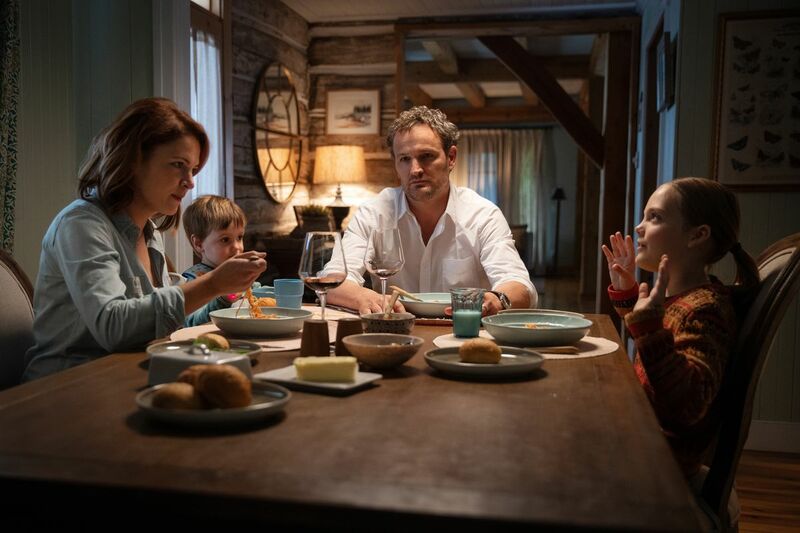 Much like the book and the original feature, the story revolves around Louis Creed (Jason Clarke), a big city doctor who has just moved to a town in rural Maine to slow things down a bit and to spend more time with the family. 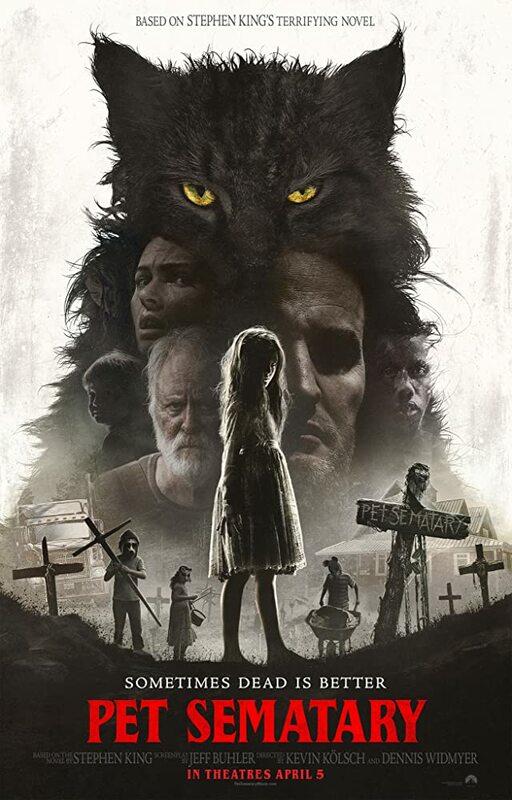 After purchasing an old house on a giant plot of land, he and his family discover their backyard is home to a 'Pet Sematary' that the town children use to bury their pets. 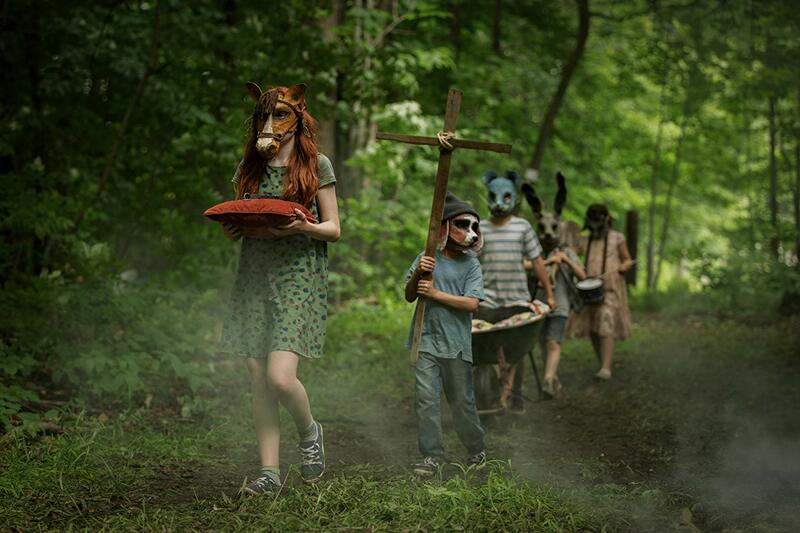 The kids do this while wearing weird animal masks that look like they're about to burn someone in a giant Wickerman so the town can have a better harvest. Beyond this 'pet sematary,' however, lies a different type of burial ground, one where the soil has "soured" and holds strange magical properties. When tragedy strikes the Creed family, Louis tries to make things right by using this mystical cemetery for his own personal gain, though his good intentions wind up making things much worse. We were very excited to see this new incarnation of "Pet Sematary" (2019). It had some great buzz from its early screenings at SXSW film festival, and we really liked Kolsch and Widmyer's previous film "Starry Eyes." Also, while we like the original, we don't exactly have a strong affinity for it and were open to a new incarnation of the material. There are some elements in the "Pet Sematary" (2019) remake that we like. John Lithgow gives a great performance as Jud, the next door neighbor who shows Louis the previously mentioned 'soured ground' beyond the pet sematary. Some of the makeup work is unsettling, there are a lot of excellent gore effects, and there are times when Kolsh and Widmyer set a sufficiently creepy atmosphere. They do try to change things up a bit from the original, and we commend them for at least trying to do something new. That being said, somewhere along the way, it feels like the directors became far too considered with surprising the audience by switching things around that they lost the spirit of the story. The emotional family aspect at the finale of the original was one of its best features, and the new version winds up falling flat by movie's end because we don't care about any of the characters. We also think Kolsch and Widmyer rely too much on the audience having seen the previous version so many times that they can recall small, minute details about it. 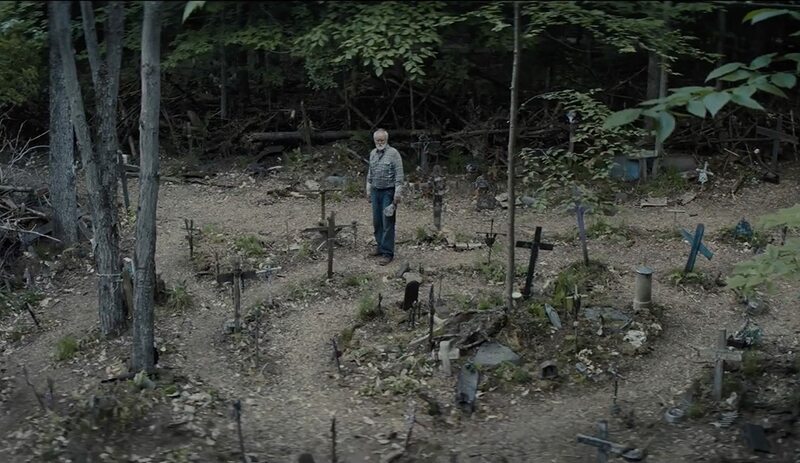 Throughout "Pet Sematary" (2019), they foreshadow things that happened in the 1989 iteration, leading the audience to think things will be the same, only to pull the rug out from under us to do something different in a try-hard, unnatural way. It feels like it's full of memberberries. "Oh, remember when this thing happened in the original? If you do, you know what's going to happen. We are heavily intimating it is going to be the same. Guess what! Nope! WE FOOLED YOU! ~*Gotcha!~*" It's fine for remake directors to do things differently, in fact, we encourage it, but don't pretend over and over that you're not going to change things around just so you can offer a cheap shock to the audience. It becomes distracting from the things that are actually important to the story. In the end, "Pet Sematary" (2019) is a mixed bag of a horror movie. We didn't get the emotional connection we had hoped for from this version, and we were underwhelmed by most of the performances and characters. Despite having some elements we enjoyed, we wound up being displeased and a little disappointed with the final product.